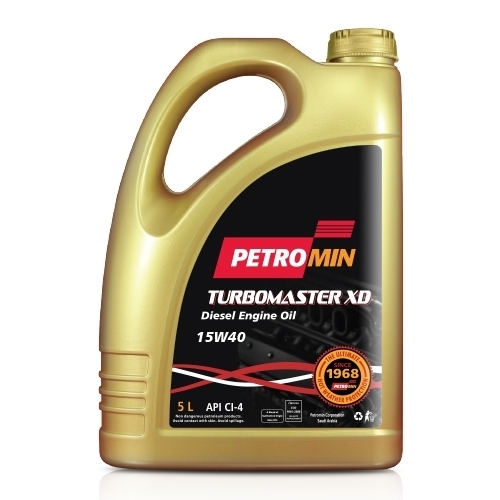 PETROMIN TURBO MASTER XD SAE 15W-40 API CI-4 is premium quality automotive engine oil meeting future, current and obsolete engine oil performance level, particularly European and American standards. It is an ideal mixed fleet engine oil meeting API CI-4/SL and ACEA E5/B3. The superior additive chemistry used in manufacturing Petromin Turbomaster XD is performance proven to provide the highest diesel engine performance levels. It is mixed fleet engine oil for heavy-duty diesel vehicles and passenger cars. Its high performance capability meets the requirement of CUMMINS, MTU, VOLVO, MAN, MERCEDES-BENZ, MACK and RENAULT manufacturers. It is recommended engine oil for both on-highway and off-highway vehicles ¬fitted with new engines for low emissions and old engines of conventional design fuelled by low and high sulfur diesel fuels. Petromin Corporation (Petromin) is a leading lubricants and automotive services company in the Kingdom of Saudi Arabia operating four lines of business: oil lubricants, car servicing (Petromin Express), fuel retailing and car dealerships. With more than 5,000 employees, Petromin exports its products to over 40 countries in the GCC, Middle East, Africa and Asia. Operating in the Kingdom for nearly 50 years, Petromin traces its origins back to 1968, when the company built its reputation for producing the highest quality lubricants in the region. In 2007 Petromin went through a change of ownership and the start of a journey that has transformed the business into the leading automotive services company it is today, with an unmatched reputation for the highest quality products and services in the industry. Excellence and continuous improvement is Petromins motto. As we strive to exceed expectations our own and those of others we aim to undertake new professional challenges and ventures, with a sustainable accountability as a framework. Thus, business-oriented and thinking out of the box are our special characteristics.